British music for the cello flourished in the first decades of the twentieth century and created a fertile seed bed for the gifted generations of composers to come. The four composers heard on this recording never achieved widespread fame, owing to early death or a reluctance to promote their music, but their contribution to the repertoire is substantial and very personal. 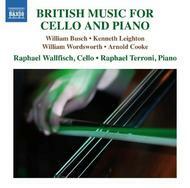 Two of the works � by Busch and Leighton � were composed for the well-known cellist Florence Hooton. The programme is played by one of the most admired duos of recent times, Raphael Wallfisch and Raphael Terroni.